Real estate rules notified: What it means to you? So the rules for the Real Estate Regulatory Act were notified for the Union Territories on October 31st as per requirements. Is that a cause for celebration yet for Indian home buyers? The answer is a resounding yes. The fact is that these rules will become the model on the basis of which the states can draft their own regulations and rules. Some leeway has been provided to the states to make changes according to their own special requirements. But model rules make state-level policy-making easier. Explains one expert involved in the entire process who did not want to be named, “Notifying RERA rules is a relatively simpler process where the executive can draft them and just needs to be signed off by the cabinet ministers.” This holds promise of most states meeting their RERA rules notification and creation of regulator deadline of April 2017. The regulatory authorities are to become the recourse for the consumer with speedy justice in two months, passive display of information to allow consumers to make informed decisions and also to legislate against errant developers. So how will RERA impact you as an end consumer? It is important to analyse the details of the notification that was released by the Ministry of Housing and Urban Poverty Alleviation. 1) If you buy a project, you will be able to assess exactly how much liveable area you get. It is mandatory for developers to declare the carpet area which was earlier hidden in the format of super area. Carpet area is the actual liveable space within your house. Super area is what you are charged for carpet area plus external common areas such as lift lobbies and corridors. As a result while absolute prices may not come down, for you as a buyer, purchasing liveable space will be cheaper. Promoter shall also declare size of the apartment based on carpet area even if it was earlier sold on any other basis. 2) You also get to know how much covered and uncovered parking space there is in the development. This has been a major bone of contention with many buyers in different cities. Promoter also has to declare information regarding the number of open and closed parking areas in the project. 3) Another critical benefit of the RERA is that the money that you paid to buy a project will be used for that project only. The developer needs to deposit 75% of collections into a seprate account that will service the project. The developer, within three months of applying for registration of a project with the Real Estate Regulatory Authority shall deposit in a separate bank account , 70% of the amount collected and unused for ensuring completion of ongoing projects. 4) As per the RERA, all projects that are ongoing and not handed over to consumers will be under the purview of the regulation. Developers have been asking for this to be restricted to projects launched in 2016, but that is against the spirit of the Act which is drafted to ease the misery of consumers who have been struggling with non-delivery of projects that have been paid for. In respect of the ongoing projects that have not received completion certificate in specified time, developers will have to make public the original sanctioned plans with specifications and changes made later, total amount collected from allottees, money used, original timeline for completion and the time period within which the developer undertakes to complete the project, duly certified by an Engineer/Architect/practicing Chartered Accountant. Many inconsistencies and unfair trade practices will come to an end. This includes the fact that both developers and consumers have to pay the same rate of interest for delay in payments and deliveries. Developers will be required to refund or pay compensation to the allottees with an Interest Rate of SBI’s highest Marginal Cost of Lending Rate plus 2%. Further to an assurance given by the Minister of Housing & Urban Poverty Alleviation to the Parliament during passage of the Real Estate Act, Rules stipulate such payment to the allottee be made within 45 days of it becoming due. This interest applies to payments due to the developers by the allottee which is to be paid within the period to be specified in the Agreement of Sale. 5) One of the biggest problems that many consumers faced was the fact that there were changes in the plans after selling started so that they had no idea how the project would pan out on completion. This has been specifically addressed by mandating developers to put up earlier and changed approvals in the public domain for scrutiny. In respect of the ongoing projects that have not received completion certificate in specified time, developers will have to make public the original sanctioned plans with specifications and changes made later, total amount collected from allottees, money used, original timeline for completion and the time period within which the developer undertakes to complete the project, duly certified by an Engineer/Architect/practicing Chartered Accountant. Promoter shall also declare size of the apartment based on carpet area even if it was earlier sold on any other basis. 6) Have you bought into a project and found that many years later, there has been no development? That could be a thing of the past. The new law mandates quarterly information sharing about the progress of the project. Promoter shall upload on the webpage of the project, within 15 days of expiry of each quarter information regarding number and type of apartments or plots, garages booked, status of the project with photographs floor-wise, status of construction of internal infrastructure and common areas with photos, status of approvals received and expected date of receipt, modifications in sanctioned plans and specifications approved by the competent authority. 7) Even though registration of projects and units with authorities was mandatory, there have been many instances where this was not done due to high registration charges. Keeping this in mind, the government has reduced the registration charges for projects. For registration of projects, the fee has been reduced to Rs.5 per sq.mt for up to 1,000 sq.mt area and Rs.10 per sq.mt beyond this limit subject to a maximum of Rs.5.00 lakh per project. For commercial and mixed development projects, it will be Rs.10 and Rs.15 per sq.mt subject to a maximum of Rs.7.00 lakh. For commercial projects, it will be Rs.20 and Rs.25 subject to a cap of Rs.10 lakh per project. For plotted development, it is Rs.5 per sq.mt with a ceiling of Rs.2.00 lakhs. A cap has been placed on the total amount of registration fee based on the suggestion of real estate bodies. Fee for renewing registration of projects with the Regulatory Authorities would be half of the registration fees. 8) Searching for real estate agents has been a challenge for buyers across the country. Normally one would look for a recommendation from someone who has used the services earlier. This may well be a thing of the past with registration of agents coming under the ambit of RERA. For registration of Real Estate Agents, fee now prescribed is Rs.10,000 for individuals and Rs.50,000 for other entities as against Rs.25,000 and Rs.2,50,000 proposed in the Draft Rules. Similarly, fee for renewal of registration of projects and agents has also been reduced to Rs.5,000 and Rs.25,000 respectively. 9) Once the regulatory authorities are in place, consumers can approach the authority which has to dispose of the case in 60 days. That will come as a great relief to buyers, many of whom have battled in court for years against powerful legal teams of developers to seek justice. Under the Rules, Adjudicating Officers, Real Estate Authorities and Appellate Tribunals shall dispose of complaints within 60 days. 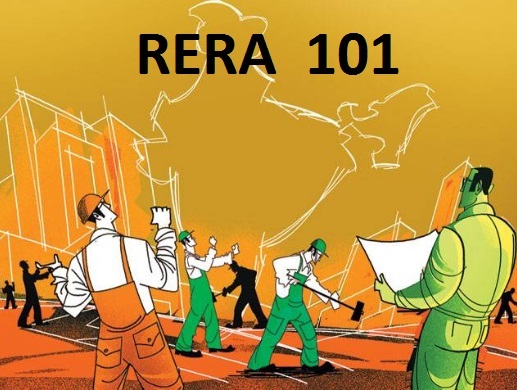 Keep watching this space for more 101 write-ups on the RERA as we do a deep dive into this critical legislation that will bring order and harmony into a critical sector that serves as an economic indicator in most developed economies. http://360propertymanagement.in/wp-content/uploads/2016/10/logo-1.png 0 0 admin http://360propertymanagement.in/wp-content/uploads/2016/10/logo-1.png admin2016-11-15 16:21:042016-11-07 16:23:24Real estate rules notified: What it means to you?